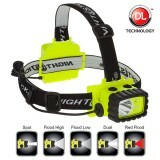 These 3 AAA dual-function headlamps are cETLus, ATEX and IECEx listed Intrinsically Safe. Featuring a multi-position tilt head design and includes an elastic head strap with a non-slip lining and a heavy-duty rubber head strap for use on a hard hat. 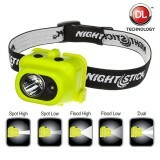 The top mounted switch provides user selectable high or low brightness spotlight operation. Power comes from 3 AAA batteries (included). Model XPP-5452GC utilitizes a stainless steel clip and mounts directly to a helmet using the included NS-HMC4 Helmet Lamp Bracket. Just peel and stick the heavy duty PSA material for complete hands-free use that requires no drilling into a hard hat. 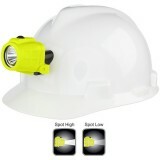 These X-Series Intrinsically Safe Low-Profile Dual-Light™ Headlamps are cULus, ATEX and IECEx listed Intrinsically Safe and is designed specifically to work on fire helmets and hard-hats that have a flip-up face shield. 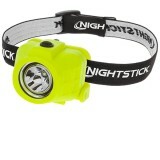 The unique low-profile shape allows the user to work without having to remove the headlamp when raising or lowering their face shield. The XPP-5460GX and XPP-5460GCX models are manufactured from glass-filled nylon polymer and features a multi-position tilt head design. Both the spotlight and the floodlight use an advanced (TIR) Total Internal Reflection lens on each LED designed to optimize lumen output and beam pattern. Front mounted dual switches provide easy access to the spotlight for distance illumination, the floodlight for close-up illumination, and Dual-Light for maximum lighting, versatility and user safety. The XPP-5460GX includes a heavy-duty rubber head strap for use on a fire helmet or hard-hat. 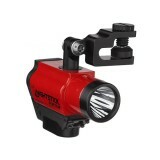 Model XPP-5460GCX includes a helmet lamp mount (NS-HMC4) that eliminates straps and bands. Both lights are powered by 3 AAA batteries (included). 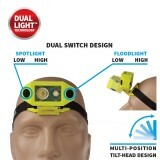 These 3 AAA dual-function headlamps are cETLus, ATEX and IECEx listed Intrinsically Safe. 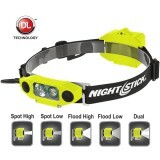 They feature a multi-position tilt head design. Model 5450G includes an elastic head strap with a non-slip lining and a heavy-duty rubber head strap for use on a hard hat. 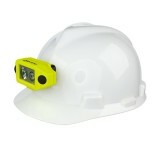 Zero-Band model 5450GC includes a stainless steel clip and model NS-HMC4 helmet lamp bracket for hands-free use. The top mounted switch provides user selectable high or low brightness spotlight operation. Power comes from 3 AAA batteries (included). 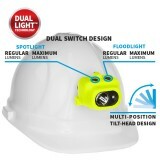 The DICATA™ Intrinsically Safe Low-Profile Dual-Light™ Headlamp is cULus, ATEX and IECEx listed Intrinsically Safe and is designed specifically to work on fire helmets and hard-hats that have a flip-up face shield. 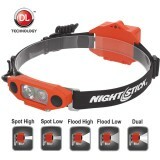 The unique low-profile shape allows the user to work without having to remove the headlamp when raising or lowering their face shield. The XPP-5462RX is manufactured from glass-filled nylon polymer and features a multi-position tilt head design. Both the spotlight and the floodlight use CREE® LED’s and an advanced (TIR) Total Internal Reflection lens designed to optimize lumen output and beam pattern. Front mounted dual switches provide easy access to the spotlight for distance illumination, the floodlight for close-up illumination, and Dual-Light for maximum lighting, versatility and user safety. The XPP-5462RX includes a heavy-duty rubber head strap for use on a fire helmet or hard-hat, and is powered by 3 AA batteries (included).